This page may scare you... and it is meant to! The amount of fraud within the pet industry is increasing every single day. 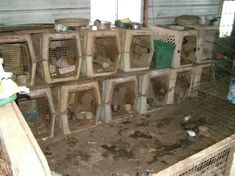 This includes puppy mills, backyard breeders, pet brokers, flippers, and even many shelters and rescue organizations! The best way to avoid being scammed or purchasing an unhealthy pet is through a reputable breeder. But what IS a reputable breeder? How do you know if you have found one? No matter what breed you are considering, this page will help you in your search! There is a lot of information here but I promise you that it WILL be worth your time. Not all puppies are created equal... and that starts with the breeder! Toys, playpen, dishes, leashes, collars, treats, etc. All of the above assumes a normal breeding, gestation, labor, and delivery. This does not take into account our time, sleepless nights, experience, education, etc. What price is sleep and 24/7 care? Missing work because you're too tired from being up all night supervising mom so she doesn't squish a puppy? We have an enviable survival rate once the puppies are born - that's because we're there for the mom - she's not alone out in a kennel or garage where anything can happen unseen by the breeder. If necessary, we'll sleep with her the entire time the puppies are with her (usually until they go home). We sit with her through delivery and are always nearby to make sure mom doesn't squish a puppy and that all are fed and supervised properly. Our concern is that our puppies get the best start possible. The work of a responsible and ethical breeder will not always end when the puppy goes to their new family either. Some families are experienced dog owners and know exactly what to expect when raising a new puppy. New pet parents with less experience often need support, advice, direction, recommendations, tips, etc. throughout that puppy's life, especially during the first year. Life events sometimes come up that result in a familiy having to give up their beloved canine companion. A good breeder will always be willing to take one of thier puppies back in any situation, at any age, or help to find them a new home. Well bred dogs do not ever end up in shelters because they always have a home available to them back with their breeder! Not every breeder does all that we do and many undesirable breeders can be picked out right away by a responsible new puppy family that takes the time to properly research the breed they are considering. With a little preparation by reading through several individual website descriptions of that particular breed including physical traits, typical disposition, trainability, grooming requirements, and common health concerns, it becomes much easier to pick out those deplorable "breeders" that have minimal education or experience regarding the breed that they are producing! That information, along with being armed with the basic knowledge of ethical and responsible breeding practices provided on this page, will give you the tools you need to make sure your new furry family member has the greatest potential for a long and happy life - Sure, you can spend less buying a puppy from one of the countless puppy mills, pet brokers, and those that just want to turn a profit - and then spend MORE in vet bills later nursing your puppy back to health (if it's not too damaged by being raised improperly or from some disease it caught in poor living conditions). To us it makes more sense to give you a healthy puppy you can enjoy and play with, rather than waste their puppy hood nursing them back to health...but that's just us. We are very proud of the fact that our puppies go home healthy and they're CLEAN and well socialized too...(which doesn't just happen by itself). We are happy to have many of our happy puppy families share stories and photos of their Kack's Poo with us, with the families of their puppy's littermates, and with potential new families openly and honestly on our Facebook page. One of my biggest peeves with breeders are those that put more effort into producing or developing a certain physical trait at the expense of the animal's health. I raised and worked with purebreds for many years prior to making the switch to crossbreeding after years of study and research on the benefits. So many breeds have been destroyed by breeders that placed a higher value on a certain "look" instead of breed health, functionality, and vitality. A prime example is the bulldog. Most can't breed without veterinary intervention, they can't handle anything other than mid-range temperatures, their skin is so wrinkled and in excess that it is often one big sheet of infection, and like most brachiocephalic breeds they have had their snouts bred shorter and more deformed with each generation that they can barely breathe. Please watch the video at the bottom of this section! Many of the breed standards amoungst various purebreds have changed over time with no regard to the detrimental effects, especially breed specific diseases/disorders increased exponentially by "linebreeding" to encourage those traits... by those that don't have enough knowledge of breed/bloodline/pedigree/genetics to even attempt a linebreeding in the first place. Now comes the crossbreeds or "designer" dogs. Some of us began crossbreeding due to recognizing the decline in health and function in purebred lines. Some of us because we found traits in one breed could improve an undesirable trait in another breed that we loved, and saw that improvement was needed. Some found that crossing certain breeds could make it possible for mild to moderate allergy sufferers to share their lives with a breed they would never have been able to tolerate otherwise. The reasons that crossbreeders give for the combination that makes up their particular breed choices range from brilliant to ludacris and everything in between. competitors/pet professionals try to make them see how irresponsible it is to make false claims that could result in a puppy not being able to stay in their new home when they get older... (and the puppy fur is replaced by the adult coat which is more likely to induce an allergy reaction)... they usually just become more insistent... and THEN they drop the ultimate false claim spread by these people - that they don't shed because they are Multigeneration crossbreed puppies... (FACEPALM!)... and there sits that puppy scared and alone in a shelter not understanding what he did wrong... because little Johnny was highly allergic to the puppy which ended up shedding like a beast! I apologize for ranting, but this is just one of the many stories that I hear daily. This is also the reason why we choose to refer to our Aussie x Poodle cross puppies as AussiePOOS instead of AussieDOODLES. While they are in fact the same, we aren't about just cashing in on the "doodle craze". Ok, back to multi-gen breeding. So to be fair, yes, the coat consistency (of texture) is improved. The coat typically gets a bit softer in future generations. They still can shed. Many very minimally, just like most of the first generation shed very minimally. But some shed a LOT. In fact, as the owner of a grooming salon, I am a bit of an expert on the subject. I have found that almost every heavy shedding doodle that has come into my salon was a Multigen. I mention the shedding first because that seems to be the first question that comes up with potential puppy families. Unfortunately, the problem with Multigens is often much deeper than a bit of loose hair. The benefits of the practice of crossbreeding are FACT. However, I cannot stress enough the importance of genetic testing the purebred parents for every disease that tests have been developed for. If all it takes is a simple cheek swab to prevent breeding puppies with potential future health problems... Those genes can and should be completely eliminated from any breeding program. The diseases/disorders that cross into all breeds and do not yet have a genetic test available can still be minimized by a thorough knowledge of the ENTIRE health history of a breeding animal's last 3 generations (at minimum). Unfortunately many "breeders" do not have any health testing completed on their breeding dogs (many aren't even registered purebreds either). It takes a chunk out of their profit margin, so they again turn to some rehearsed sales pitch to convince potential puppy buyers that it is somehow unnecessary. Some claim they do various health testing but have not, or worse show results from another dog altogether and claim it to be their own. It is very important to ask to see verification of testing and results, and that those results show that dog to be permanently identified prior to that testing by a microchip or other permanent method. Many of the genetic laboratories have options that allow breeders to post the results of their breeding dogs online for public viewing. However, one of the biggest offences in my book are those that advertise multi-generation (f1b, f2, f3, and so on) crossbreeds as if they are more desirable, when in fact in most cases, it goes against the very fundamental reason we cross-breed in the first place, hybrid vigor, or the scientific term, heterosis. To explain it in the most basic way, many purebred lines are riddled with diseases due to inbreeding or bloodlines that trace back to the same small handful of dogs. Each parent throws 1 copy of a particular gene to their offspring. If only 1 parent throws the particular gene, the offspring can be carriers of the gene, but not have that particular disease themselves. If both parents throw a copy of that particular gene to the offspring, now they can have the disease. Although there are some diseases which span all breeds, many diseases/disorders are inherent to a particular breed or group of breeds. When you crossbreed two different purebred lines, that FIRST GENERATION is typically extremely healthy. This is because their genetic makeup is coming from two different PUREBRED lines, making it much less likely for them to have the same disease/disorder gene coming from BOTH parents needed to cause disease. When you take that extremely healthy first generation crossbreed and breed it back into one of the purebred breeds, their offspring (F1b puppies) have the potential to now have both copies of the gene necessary to cause the diseases common to that particular purebred parent breed. Even worse are those breeders that take that healthy first generation crossbreed and completely ruin it by breeding it back to another crossbreed. Now their offspring (F2, F3, etc.) have the potential to now have both copies of the gene necessary to cause all of the diseases inherent to BOTH purebred parent breeds!! When these "breeders" mix a crossbreed with another crossbreed OR a crossbreed back to one of the purebred parent breeds, they are starting the cycle over again, putting looks above health. There are a few exceptions to this as noted below. It is for this reason that I advise families to ask what breed are the parents... if the response is anything other than a purebred dog... avoid that breeder unless you are willing to do your due diligence in researching that breeder! Multigeneration crossbreeding should ONLY be attempted by the most experienced and educated breeders that are willing and able to keep the strictest of records and possess the moral integrity to undertake such breedings. By breeding multi-generation, the breeder is attempting to create a new breed which produces consistent results and breeds true. Strict records must be kept for such an undertaking, otherwise they are breeding for profit only with no regard to breed integrity. Ok so what should you look for in a Multi-generation crossbreed? What are the exceptions? The exceptions being if strict and VERIFIABLE records are present and available for inspection by potential puppy families showing that health testing on the purebred lines of origination, proof of purebred registry of the originating parent canines, and DNA verification of parentage of each subsequent generation to prove integrity of the bloodline. We also like to see breeders that permanently identify their breeding dogs by microchip prior to that testing so that the permanent identification is listed on all results. If all of this is done, congratulations! You have found an outstanding breeder! We are rare, but we do exist, I promise! Our puppies are BORN AND RAISED INSIDE OUR HOME! (sure it's a lot easier to raise them outside in a garage or a kennel because there is a lot less they can get into - but you are also more likely to lose puppies to cold, disease, new mom inexperience, or accidents as well. They don't learn to be good house pets that way either. Many breeders do utilize some type of kennel or containment system for increased safety and security of their adult breeding dogs as needed for separation during heat cycles, introductions, during yard treatments or disinfection of a puppy area, in preparation for grooming or training sessions, or for a safe place to exercise puppies in short sessions during good weather. It is our firm opinion that no dog should spend their life in a 10 x 10 jail cell with limited interaction only when it is convenient to the "breeder". 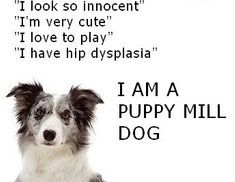 How do you want your puppy to be raised? We genetic test our breeding dogs to make every effort to produce the healthiest puppies. However, it is important for the new puppy owner to be aware that environmental factors can cause issues in an otherwise healthy puppy. Proper diet, exercise, grooming, & proper veterinary care are all absolutely necessary to keep your puppy healthy throughout his/her life! The following are some of the available tests within OUR BREEDS that we feel every reputable and ethical breeder should be performing on their adult dogs prior to even considering them for breeding. We recommend Paw Print Genetics, our preferred lab, as a reference link for other breeders that may be looking to improve their lines and raise their breeding program standards to our level. Our goal is to help educate both the potential puppy buyer and other breeders as to what should be minimum expectations. These tests are widely available and everything is done via the mail so there is absolutely NO EXCUSE for any breeder to not have this testing done and results available for their puppy families to see personally. Each breed has their own recommended tests and can be found with a simple google search of "the breed name + recommended genetic testing". Some of the labratories available for this testing include AnimalGenetics, OptiGen, GenSol Diagnostics, NYU Medical Center, PennGEN Laboratories, Paw Print Genetics, and the following universities: Auburn, Cornell, California, Minnisota, Missouri, Pennsylvania, Michigan State, North Carolina State, Washington State. All listed genetic testing HAS BEEN COMPLETED on our breeding dogs. We have made the switch to using Paw Print Genetics exclusively, as they give us the ability to make all results of our dogs' genetic testing available online to the public via their site Paw Print Pedigrees. There are no available genetic tests offered at this time. We cannot stress enough the importance of a breeder's personal knowlege of the last several generations in breeds that do not yet have breed specific genetic testing available. Any of our puppy families or potential puppy families are welcome to come view all results and certifications at any time. I keep a folder with all paperwork including registrations, pedigrees, competition records, and health testing along with each dog's general health and vaccination records out and ready to view at puppy pickup time as well. We do not and will not breed any animal that is not completely healthy to the best of our knowledge! Dependant upon the incidence rate within the breed being evaluated, orthopedic testing may or may not be warrented to certify the integrity of canine hips, elbows, shoulders, patellas, and more. While there are benefits of these tests, they are limited and can be manipulated. Therefore we feel genetic testing and a thorough knowledge of the last several generations of parent dogs are of a much greater value to a breeder and potential puppy families due to the fact that, although genetics might play a role in the development of bad hips, the effects of non-genetic environmental factors such as food consumption and subsequent body weight and/or composition, as shown below, is of greater significance. However, beware of breeders that are not doing any OFA testing on their breeding dogs. If they do not want to make this investment... What are you paying for? A very informative blog article written by Carol Beuchat, PhD from the Institute of Canine Biology on the topic can be found here and is also where we found the helpful illustration chart shown above. BUYER BEWARE of breeders offering hip guarantees of less than 3 years. 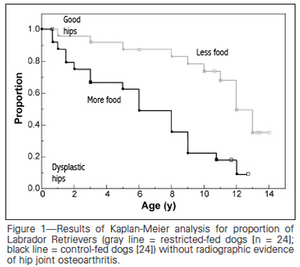 Hips cannot be evaluated for certification until 2 years of age. Offering a guarantee for the first 1 or 2 years of life is the same as offering no guarantee at all. Many dishonest breeders offer these short term hip guarantees to give buyers a false sense of security or value. One of the most important factors contributing to the health and well-being of ANY puppy, adult, or senior pet is nutrition. As a breeder, groomer, and most importantly as a veterinary technician, I have seen and heard a lot of concerning information out there. That is why from July 2012 through July of 2013 I conducted my own feed trials. I had help from many of my wonderful puppy families and dog grooming clients so that I could cover different breeds, sizes, ages, and health ailments. A total of 8 brands of food and 3 supplements were included in the trials. I discovered that improvement was seen in all dogs using one of the supplements regardless of the food that was fed. One of the foods in the trial also came out far above the others. It is for this reason that I now require all of my puppy families to continue the use of these supplements and approved food to keep their limited LIFETIME guarantee in place. That being said, I want to be able to provide this information to everyone interested in their pet's nutrition and overall health and happiness. Below you will find some general information about each, taken direct from the manufacturer's websites. The great thing is neither is sold at retail stores. You can only purchase them through your veterinarian, groomer, breeder, trainer, or other reputable pet professional. You also have the ability to order direct from the manufacturer yourself, as the pet owner, so you know you aren't paying to support some big box retailer. I hope this is helpful and remember I am available to you anytime you need additional assistance or information. · NuVet Plus helps to fill the nutritional void that exists in virtually all pets. Even the highest quality dog foods are cooked, and as a result, the heat from cooking kills much of the nutrients. NuVet Plus is cold processed allowing the ingredient’s rich nutrients to remain. · NuVet Plus is a full spectrum immune system builder; not just a vitamin. It’s filled with synergistic blend of anti-oxidants, amino acids, enzymes, vitamins, minerals and more designed to promote healthy cells and to help the pet’s immune system heal and even prevent disease. · NuVet Plus is 100% natural; no sugars, fillers, binders, grains or artificial flavors. This gives it superior bio-availability allowing the ingredients to be more efficiently absorbed through the cell wall. Healthy cells = healthy pets! · NuVet Plus is manufactured in the USA in an FDA registered, human pharmaceutical laboratory; almost unheard of in the pet food or pet supplement industry. This assures the very highest quality, potency and purity. In other words, what you see on the label is what you actually get. Studies have shown that products manufactured with less controls, including those from China, don’t always provide what it says on the label. · NuVet Plus is perfect for outwardly healthy dogs. By keeping the immune system functioning at peak performance the pet is better equipped to prevent disease. For puppies and kittens, it helps to boost their still maturing immune system – critically important! Note: once a condition or disease occurs, it is the result of unhealthy cells that went unchecked for months or even years. So a pet that appears healthy may not be. Taking NuVet plus daily can help eliminate this potentially dangerous situation. · NuVet Plus can help the animal deal with environmental conditions, including pollutants in the air, pesticides and more. The powerful antioxidants found in NuVet plus can help combat the free radicals resulting from the environment. · NuVet Plus is safe! It’s virtually 100% water soluble and food based, making it almost impossible for a pet to overdose. It’s also safe to take with medications. Fresher food is more nutrient-rich. While leading brands stockpile tons of food for months on end, our healthy dog food is made weekly in small-batches so it’s only 4-to-6 weeks when it’s delivered. When you buy this Life’s Abundance dog food, your sweet pup will benefit from our strict inventory controls and product safety considerations that are second-to-none. Put your K-9 on the path to wellness. Provide them with a recipe for a long and happy life. As you search for the perfect puppy, you'll probably come across one of the most deplorable things about dog breeding - puppy mills. Unlike show or hobby breeders, puppy mills breed large numbers of dogs in less than ideal situations in order to make money. Often the parent dogs are poor specimens of the breed, since reputable breeders try to make it hard for puppy mills to get their puppies for breeding stock. Usually these puppy mills will sell their puppies very cheap, many times less than half of what a reputable breeder is asking. They want to make a quick sale and they don't have the money invested in high quality breeding stock, health testing, quality feed, and enrichment for their breeding animals. Although the area you may see looks like a regular family home with a healthy dog or two running around, a scene like the one below may be hidden in a garage, barn, basement, or even off-site. Breeder is "USDA Licensed" always means puppies are being mass-produced or they sell without personally meeting and screening buyers! This is often, but not always, the case with state licensed kennels also, depending on the laws for their particular state. You don't want a puppy coming from a place like that! --What breed are the parents of the litter? Are they registered? Am I able to view the registration in person when I meet or pickup my puppy? Parents should always be registered and you should always be able to see that original registration document. Many breeders will NOT send a copy of registrations to protect their interests from fraudulent breeders, as we have to be weary of them also. But there is no risk of showing these records to anyone in person. Beware of fake photocopies. -- What are the possible health concerns in this breed? The breeder who says "none" or "I don't know" is to be avoided. That is a person who is definitely not screening for what he/she doesn't know about, and you don't want to pay the price for their ignorance. -- What steps have you taken to ensure your puppies are healthy? You want to hear words like "screened" and "tested" and "certified". --How can I verify the testing completed on the parents? You should be provided with a link to the laboratory website, copies of test results directly, or a statement from their veterinarian citing the tests and results. -- Do you have the parents on site? May I see them? You should always be able to see the mother but some breeders may not have the stud on hand. That's because the best match for any particular dog may be owned by another breeder, and the female was sent away for breeding. Some breeders have a Guardian Home Program for their breeding females. In that case, it is acceptable for the mother to not be on-site after puppies are weaned. You should however be able to view photos, health records, registration papers, and the Guardian Home CONTRACT! --What guarantees do you provide? You want to see a contract explaining the breeder's responsibilities should the puppy develop a specific congenital defect. In most cases, such contracts state either replacement with a new puppy or refunding of your purchase price. However many breeders will not make any guarantees against eye issues, hip dysplasia, or bloat since environmental factors can cause issues even in a perfect puppy. BUYER BEWARE SPECIFICALLY OF HIP GUARANTEES THAT EXPIRE PRIOR TO THE DOG REACHING 2 YEARS OF AGE - hips cannot even be certified until a puppy reaches 2 years of age so giving a guarantee that expires before that age is like giving no guarantee at all! The contract should also state your responsibilities, such as spaying or neutering your pup. You may also be required to return the dog to the breeder if you can no longer keep him. Such language is the sign of a concerned and responsible breeder.